“Breastfeeding is an unequalled way of providing ideal food for the healthy growth and development of infants; it is also an integral part of the reproductive process with important implications for the health of mothers. As a global public health recommendation, infants should be exclusively breastfed for the first six months of life to achieve optimal growth, development and health. 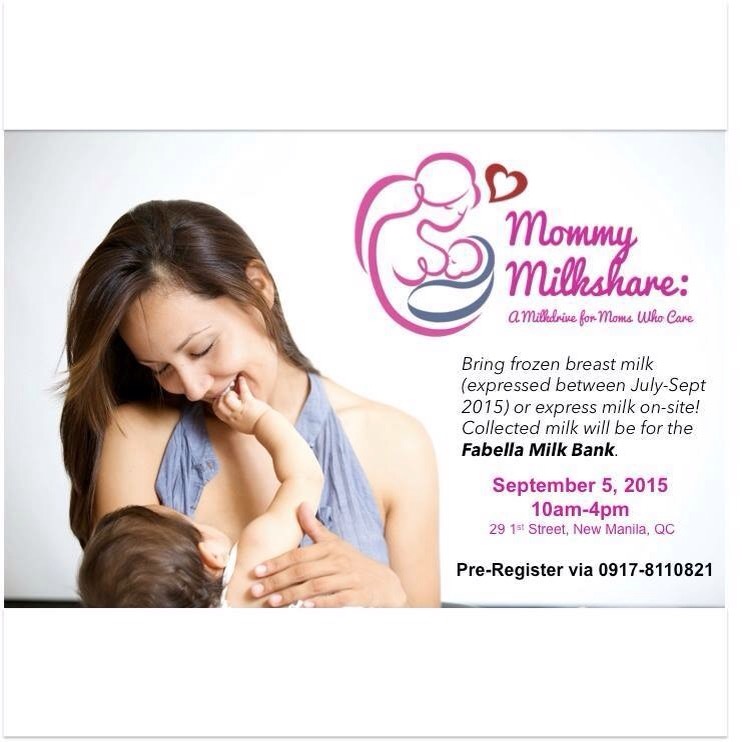 Bearing this in mind, two breastfeeding-advocate-minded local enterprises are holding a post-Breastfeeding Awareness Month event to help provide breastmilk to needy babies, namely “Mommy Milkshare: A MilkDrive for Moms Who Care.” This will take place on from 10 a.m. to 4 p.m. on September 5, 2015, at The Parenting Emporium, 29 1st Street, New Manila, Quezon City. The Mommy Milkshare milkletting event is open to all breastfeeding moms who wish to donate their milk. “There is no registration fee, but it is exclusive for breastmilk donors. Mommies should bring frozen milk, expressed within 3 months, and should also be willing to be screened,” Maricel expounds. Aside from the milkletting activity, participants can expect different activities as well. It is hoped that through this event for moms by moms, the message of “growing together as parents” will be shared to all, and that parents — especially mothers — will be encouraged to protect, promote and support breastfeeding, and share what they have with others. To pre-register for the event, kindly contact the TPE Events Hotline: 0917-8110821. For updates from The Parenting Emporium, please send an email to theparentingemporium@gmail.com or follow TPE on Facebook and Instagram @theparentingemporium. To get in touch with Honeysuckle Philippines, contact them on Facebook and on Instagram @honeysucklephils. Hi Joyce, Speaking of Milk, I have a friend who is in dire need of help right now. SHe has two kids with Cerebral Palsy. Right now, I saw in her facebook wall that she is currently in NEED of DONORS for these particular milk: 1. GA Milk from Mead Johnsons (tryptophan-lysine free milk) and 1. 2.PFD (protein free) milk . My friend said it is only available in the USA and they are actually praying for donors who can send them the milk. I feel so sorry for my friend and I am hoping you might know people who can provide the milk for free. THank you in advance.